Relocating to Florida opened the door to new challenges, something Leroy tends to gravitate toward. When not kitesurfing, he would be diving, surfing, stand-up paddleboarding, spearfishing and paragliding, a complete new world from the mountain life he previous led. Having his pilot’s license from a young age, he learned to paraglide with his dad 10 to 12 years earlier but had stopped flying until a few years ago, when he and his friend Harry Andrews got engines and wings. 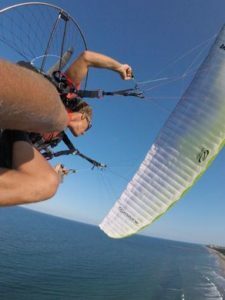 Having just returned from traveling and filming an upcoming Hollywood movie (“Baywatch”), Leroy was at the beach with his good friend Jacob Olivier, who was preparing for his first powered paragliding flight. Olivier had been flying for more than a year and according to Leroy is super-talented at everything he tries.